Of America’s 50 states – and Washington DC – you need only look at a handful on election night to learn who will be the next President. These are the so-called ‘battleground states’, the ones which swing more frequently from Democrat to Republican and back as the decades go by and where candidates concentrate their campaign funds. The rest are considered ‘safe’ seats, where we can fairly confidently predict the winner. These safe seats account for 418 of the 538 electoral college votes to be won on election day. That leaves 120 electoral college seats from just nine states that are truly up for grabs and where the outcome is likely to be decided. Here we look at the make-up of these crucial states and examine why the latest opinion polls (at the bottom of the page) suggest it will be Clinton and not Trump who’ll be working from the Oval Office come next January. 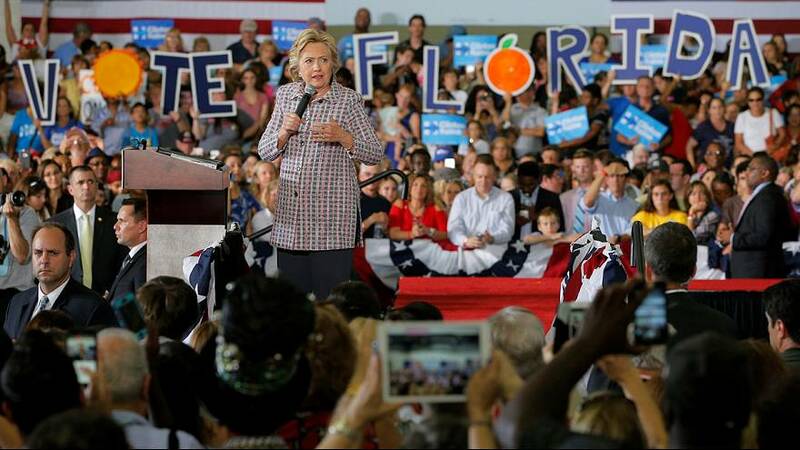 The Sunshine State has emerged as the all-decisive battleground of this year’s election. The reason is purely mathematical: if Hillary Clinton keeps all states that have always voted Democrat since 1992 in her column and wins Florida, she will be the next president. As for Trump, without carrying Florida he can win all other battleground states and still lose the election. The race there was practically tied until the first debate in late September, when polling showed Clinton opening up a substantial lead. This should put her on a path to victory, especially because of her much superior ground operation (she has ten times more field offices to bring out voters than Trump) and favourable shifts in demographics. The key is the growing Latino community that represents roughly one quarter of the state’s population, up from one fifth in 2010. Latinos used to be a reliable Republican voting bloc (Catholic, small-business, family-oriented, anti-Communist Cuban heritage) until the re-election of George W. Bush in 2004. But when the Republican Party hardened its stance on immigration, Latinos started to veer toward the Democrats. The nomination of Trump only amplified this leftward swing. Polls suggest that Clinton will carry the Latino vote by a 3-to-1 margin. Barack Obama won Florida twice, helped by a younger, post-Cold War generation of American Cubans. In addition, a massive influx of Puerto Ricans in recent years has changed the face of the Latino community and put it on a more “social democratic” footing. The increase of the Latino population in southern Florida more than helps to outbalance Republican strongholds in the north and along the western panhandle, made up of many military families and senior citizens who represent an above-national average part of Florida’s general population. Florida has voted for the eventual election winner in nine out the last 10 elections with the exception being 1992, when Florida voted Bush Snr but Bill Clinton won. Pennsylvania – the Keystone State – has been losing electoral college votes since 1960 as a result of economic transformation and population migration. Every four years, Republicans hear the siren’s song of a possible victory in Pennsylvania, only to be left facing a brutal reality: the state has gone Democratic in every presidential election since 1992. It does not look any different this year; Hillary Clinton has been ahead in every poll since mid-July. Yet, the state has been seeing a lot of campaigning from both candidates and their surrogates, largely because Donald Trump’s protectionist economic message may resonate well in both rural and industrial areas. Trump only has a plausible path to victory if he can mobilise white males in a blow-out fashion. But the white electorate keeps shrinking, nationally and in Pennsylvania. Democrats have a lock on elections in the big metropolitan areas around Philadelphia and Pittsburgh where the strong minority vote has assured huge Democratic margins in the past. Consider this: in 2012, there were 59 mostly African American precincts in and around Philadelphia where Mitt Romney didn’t receive a single vote! Furthermore, one of the most outspoken anti-Trump electoral blocs, the Latino population, has grown by more than 80% since 2000 in Pennsylvania, making it one of the largest increases in a state’s Latino population. The Buckeye State has long been considered the ultimate swing state because of its status as a reliable bellwether of the entire nation. Since 1944, Ohioans have sided with the losing candidate only once, opting for Richard Nixon over John F. Kennedy in 1960. So usually, it’s a case of ‘win Ohio, win the presidency’. This year could be different. Donald Trump had a consistent polls lead in Ohio until early October and may still win there, but even that might not be enough to take him to the White House, as the overall electoral map remains stubbornly unfavourable to him. The industrial Midwest state has been deeply hit by the financial and economic crisis and by globalisation in general. Many manufacturing jobs were lost to other parts of the United States or to foreign countries. As a result, Ohio has been losing population (relative to the country as a whole) and it has lost about one third of its electoral vote clout since the 1960s. The Trump campaign believes that a win in Ohio could be the cornerstone of an overall victory, as the state has the exact profile of Trump’s core base: overwhelmingly white, more people without college degrees and more blue-collar families than the US average. The primaries have shown how volatile this election has become, with Trump’s potent appeal among disaffected whites stretching beyond the South. Yet, Trump has two big obstacles to overcome: one, he is at war with much of the state’s Republican Party and its popular governor John Kasich who refused to endorse him and declined even to attend the Republican Convention in July. It is not clear to what extent Trump can rely on the state party infrastructure to bring out the vote. Two, Clinton’s much superior ground game that concentrates on Ohio’s vote-rich urban areas, the three Cs: Cleveland, Columbus and Cincinnati. A Clinton victory depends on a very high turnout of voters among minorities and women to offset Trump’s overwhelming lead with white males. Like many other southern states, North Carolina has voted almost exclusively Republican from 1968. This was a reaction to white conservative voter uneasiness with the civil rights legislation passed in the mid-1960s, which was effectively exploited by the Republicans “southern strategy.” The only exceptions have been Jimmy Carter’s victory in 1976 and Barack Obama’s win in 2008. In that year, Obama defeated John McCain by about 14,000 votes out of 4.3 million cast (49.7% to 49.4%). It was the 2nd closest race of the 2008 election (behind Missouri). In 2012, North Carolina was again the 2nd closest race (this time behind Florida) as the state flipped Republican. Mitt Romney beat Obama by about two percent. This year, North Carolina is a true battleground state; the race there is tight. Polls have shown Donald Trump and Hillary Clinton neck-and-neck throughout the campaign season, although Clinton began to open up a small lead in early October polling. This is a trend that is confirmed by early voting returns. Around 40% of early ballots returned so far have come from Democrats compared to 35% from Republicans. At this point in the 2012 campaign, Mitt Romney led President Obama by five points. North Carolina has undergone a profound social and economic transformation over the past decade, becoming the fourth largest manufacturing US state. As a result the state has become more diverse, with highly-educated white-collar voters who have moved there and with a fast-growing Hispanic population. This is what makes the state competitive in the 2016 election. Virginia, one of the 13 original colonies and birthplace of four of the first five US presidents, was reliably Republican (except for the landslide of Lyndon Johnson over Barry Goldwater in 1964) from 1952 to 2004. 2008 saw a change, as rapidly changing demographics put the state in play and it was won by Barack Obama, 53% to 46% over John McCain. Obama won here again in 2012, defeating Mitt Romney by a slightly narrower 51-47 percent margin. Thus, the Commonwealth became a true election bellwether, as the Virginia results were almost identical to the national outcome. Not only was Virginia won by Obama twice, its governor and both its US senators are also Democrats. Hillary Clinton has held a solid lead in all polls taken during the 2016 election cycle, and at some point in the summer stopped spending campaign resources on advertising. Clinton’s selection of Virginia’s own senator Tim Kaine as her running mate has also helped her. The state seems pretty much out of reach for Donald Trump who isn’t really competing there. The political landscape in Virginia has shifted dramatically in recent years. The reliably Republican “Old Virginia,” which is more religious, rural, working-class and white, has been outmatched by the Democratic “New Virginia,” which is more secular, urban, diverse and white-collar. The areas around the state capital Richmond and the vote-rich counties in northern Virginia fall in the latter category. As the Washington, DC, suburbs have expanded, northern Virginia has become more diverse and better educated. It is home to thousands of government workers and contractors, including many employed by defense and high-tech companies. Although surrounded by Republican “red” states (except for New Mexico to the south) and despite the fact that it voted Republican in all but three elections between World War II and 2008, Colorado is considered a battleground state due to changing demographics and the independent nature of the electorate. In 2004, George W. Bush defeated John Kerry by 4.7%, the fifth closest outcome of the 31 states won by the incumbent president. Colorado shifted in 2008, voting for Barack Obama by 54% to 45% over John McCain. Obama won again in 2012, but with a smaller margin of 5.4% over Mitt Romney. Colorado’s population has been growing, and it now has 50% more electoral votes than it did in the 1960s. Post-debates polls show Hillary Clinton with comfortable leads in Colorado, some of them in the double-digits. For much of the campaign Donald Trump believed he could keep the Rocky Mountains state in play, but that seems more and more unrealistic. The state’s electorate is a challenge for Trump. A disproportionately high number of college-educated whites (a group that Clinton carries by a solid margin), a rapidly increasing Latino population and a generally liberal political atmosphere (marijuana is legal) are not ingredients for a Trump victory. Although Trump and his surrogates have done plenty of campaigning in Colorado, the state seems out of reach for him and the Clinton campaign felt confident enough to stop advertising in the state in late July. The rural prairie state currently leans Democratic in presidential races, having voted that way in 5 of the last 6 elections. Barack Obama defeated Mitt Romney by 52% to 46% in 2012. However, prior to 1988, the state mostly voted Republican, choosing a candidate from that party all but five times ever since the Civil War years. In 2016, though, Iowa seems to be the surest state that Donald Trump can peel off from Democrats. Trump’s consistent lead in the polls had risen to five points prior to the first debate on September 26. Yet, there is only scant post-debates polling and it is probably fair to suggest that the state is a toss-up going into Election Day. The Clinton campaign is confident, though, that Iowa will eventually go their way, citing early voting returns in her favour. But this could be offset by a strong showing of Trump voters on November 8. Iowa has all the demographic ingredients of a Trump victory. It is overwhelmingly white and more than half of the white population has no college degree, compared to one third nationwide. Even as Trump’s standing in the ballot test has improved, Iowa voters’ general impression of Trump (55%unfavorable to 32% favorable) has actually gotten a little worse since July, when 51% said they saw him unfavorably, compared with 33% who said they had a generally favorable impression of him). But as polls suggest, his supporters do not care whether he is likable or not. Nevada has seen the largest percentage growth in population over the past decade (about 35%). The state gained one electoral vote, giving it 6 through to the 2020 presidential election. Although Republicans were dominant from the late 60s to late 80s, this influx of population has put Nevada squarely into the battleground state category. In 2012, Nevadans voted for Barack Obama over Mitt Romney by a margin of 52% to 46%. More than 40% of Nevada’s population belongs to minority groups, primarily Latinos and especially Asian-Americans. Both groups are culturally conservative and, in theory, receptive to Republican principles and campaign rhetoric. But Donald Trump’s harsh comments on Latinos and his tough immigration stance have sent waves of fear and anger into the immigrant communities. The Clinton campaign is prepared for this and has, in addition to its Latino outreach, a resident staff member in Las Vegas dedicated to Asian-Americans and Pacific Islanders. Staff members and volunteers here speak Chinese, Korean, Hindi and Tagalog, the Filipino language. What helps Trump, though, is the fact that Nevada has been one of the hardest-hit states during the financial crisis and many disaffected white voters have flocked to the Republican nominee. Yet, in post-debates polls, Hillary Clinton has held a consistent lead. Although surrounded by Democratic “blue” states in New England, the independent nature of New Hampshire voters leads it to be considered a battleground state in most election cycles. The once reliably Republican state has, however, ultimately voted Democratic in five of the last six elections. In 2000, though, Democrat Al Gore lost by only 7,000 votes to Republican George W. Bush. In 2012, Barack Obama won by about 5.5% over Mitt Romney. Yet, this year, Donald Trump has advantages in the state. He won a huge victory in the February primary, while on the Democratic side Hillary Clinton was soundly defeated by Senator Bernie Sanders of neighboring Vermont. Only 4% of New Hampshire’s voters are minorities, a Democratic base, and more than half of the likely electorate is made up of non-college-educated whites, the seventh-highest rate in the country for a group that tends to favour Trump. The outcome may hinge on how much independents, who account for about 40% of the state’s electorate, support Trump, Clinton or the third-party candidates. The state’s largest newspaper, The New Hampshire Union Leader, endorsed the Libertarian candidate, Gary Johnson. That was, though, before Johnson got entangled in a series of self-devastating remarks on foreign policy, revealing an astonishing lack of understanding. Election forecasts rate Clinton’s chance of winning at 64%. Just how crucial are the US presidential TV debates? Trump can’t beat Clinton – do the math!